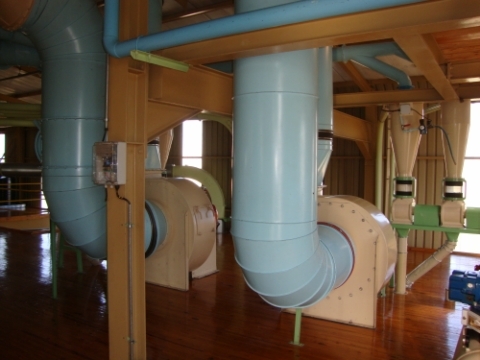 In the wheat and maize milling industry, there are typically three distinct categories of fans used in the milling process. They are namely Low Pressure Fans, operating at 1.5 to 4 kPa, Medium Pressure Fans, operating around 5 to 7 kPa and High Pressure Fans, operating at 9 to 14 kPa. Considering the pressures utilized in other industrial processes, in the pressures used on fans in the milling industry are in actual fact, relatively low. This group ranges from 5 m³/min typically on small single aspiration points, i.e. 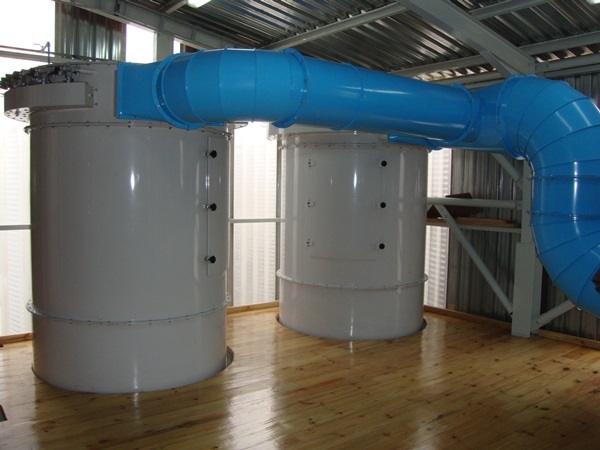 bin top filter/fan units, up to about 500 m³/min for a large mill or silo aspiration system. Seldom one finds a system bigger than that in the milling industry. The pressure range is usually between 150 mm WC where the fan is servicing a gravity operating machine and is in series with the general exhaust system and 400 mmWC. On large aspiration systems, with ducting extending from the top floor of the mill right throughout the building and including a filter unit, pressures can be as high as 400 mm WC but seldom higher. The largest motor that one is likely to find on an aspiration fan in the milling industry, would be 45-55 kW. For example, a low pressure fan delivering 500 m³/min at 400 mmWC pressure, would have a shaft power requirement of 44 kW and the fan manufacturer would install a 55 kW motor. There is a wide range of impellor designs and sizes and the low pressure fans are identified by wide impellors and diameters up to 1100 mm when the fan is directly driven, utilizing a 4 pole motor. A low pressure fan delivering 300 m³/min, would have an impellor width of approx 300 mm wide, whereas a high pressure fan delivering 300 m³/min, would have approx 80-100mm wide impellor on the circumference. Low pressure fans can also be directly driven with a 2 pole motor which results in considerbly smaller housings, impellors, but a negative is a considerably noisier fan. 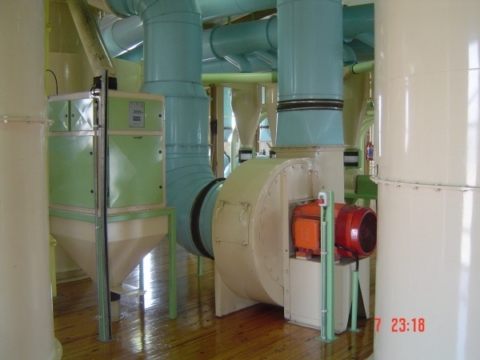 This is a small group of fans used in the milling industry and usually for single line conveying, e.g: hammermill lifts, thermo pneumatic drying or cooling lifts in maize mills, conveying the thru's from new generation degerminators or wheat debranning machines. They are not in any way identifiable from the outside from high pressure fans. For example, an MP fan handling 60 m³/min at 650 mm WC, would have a wheel 50 mm wide and about 700 mm in diameter. A HP fan could be accommodated in the same fan housing with the same 60mm wide wheel but with a diameter of 900mm and delivering 1100 mmWC in the high pressure range. The medium range of pressure can be applied because the air to stock ratio is high. 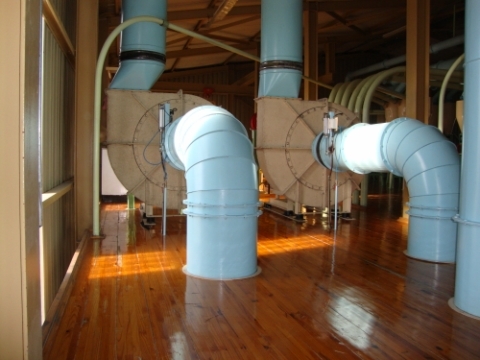 On drying and cooling lines, the air to stock ratio is sometimes as high as 0.30 kg product to 1 kg air to maximize drying or cooling effect. 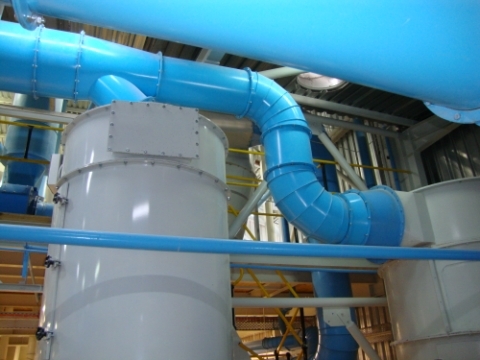 A typical example of an application to employ a medium pressure fan, would be the conveying of the thru's of a new generation high compression degerminator. The thru's can be between 15 to 20% of the machine throughput i.e. up to 1400 kg/hour on a 200 mm diameter lift with 50 m³/min. In a normal mill layout such a lift would be about 30 meters in length and have a MP fan with 500-700 mmWC absorbing 7.8 kW and driven by an 11 kW motor. The air to stock ratio would be less than 0.4 kg product to 1 kg of air. The air volume is not only conveying the thru's material from the degerminator, but also creating a negative pressure within the machine and improving the machine's performance. The air blown into the machine from the onboard fan to keep the screen clean, is also evacuated by the thru's pneumatic transport. There is no limit to the number of individual lines you can connect to a medium pressure fan, so long as there is sufficient air volume for all the individual lines and the negative pressure is sufficient to overcome all plant resistances. These fans are applied for the conveying of intermediate stocks in the milling process and the range of fans found in the milling industry, is up to 330 m³/min. 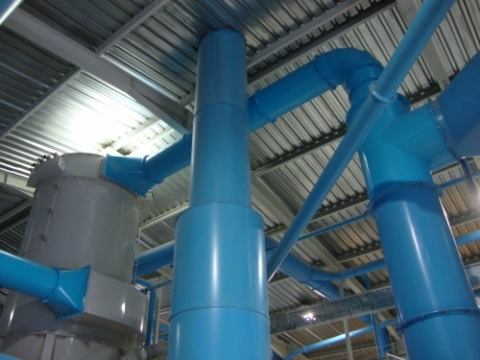 A mill pneumatic conveying system can comprise of as many as 30 lines or more on a single fan/filter system, depending on pipe sizes and stock quantities. Impellor diameters normally between 800 mm and 1060 mm (42 Inch - 1066 mm, is the largest diameter impellor we have come across in the milling industry). Width of impellor - almost never bigger than 100 mm wide on the circumference of the fan and very often the impellor tapers bigger towards the center or hub of the wheel. The cross sectional area on the circumference is usually exactly the same on the inside. Impellors with backward curved blades at 33 and 45°are most commonly used by fan manufacturers. One uses 33 ° impellors where the air is filtered and 45 ° when a main cyclone is used. The most commonly used impellor design is the use of backward curved blades. The fan, if possible, should always be placed after the filter, so as to handle the cleanest possible air and avoid stock build-up on the impellors. The efficiency of well made impellors is about 67 - 75%. The air volume required in today's modern wheat mills, is about 25-30 m³/min per ton/hourly capacity - e.g. 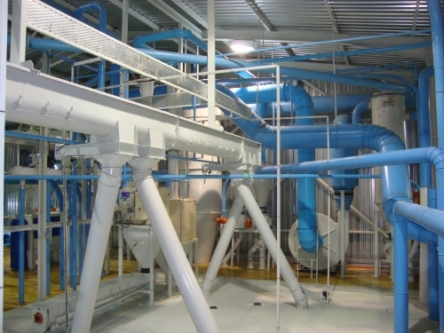 -10 tph wheat mill = 250 m³/min fan at a pressure as determined by the plant layout. The application of double rollermill passages and removing the first break lifts from the pneumatic system and replacing them with mechanical conveying, can influence this figure. Astronomical increases in the cost of electrical energy is guiding more and more milling engineers to utilize elevators on the heavy 1st and 2nd break lifts. 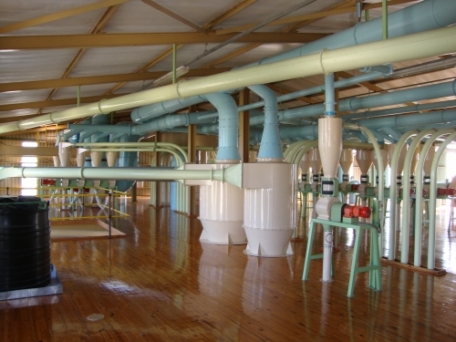 The placing of rollermills on the top floor of the mill in a wheat mill, is a new development with the stock directed from the rollermill hopper directly into the 1st break plansifter section. There are so many local factors that influence the design of mill pneumatic conveying systems, that make each one unique to the next, and the above is a broad guideline. High pressure fans are the only pieces of equipment in a mill that absorb more power when running without load. 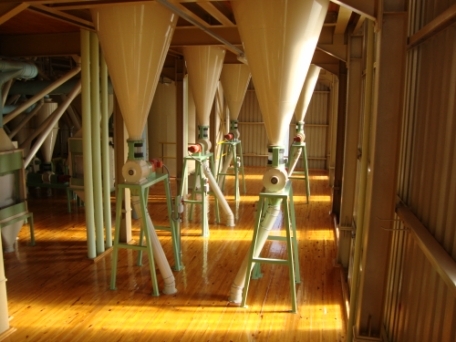 As soon as the feed is on the mill, and material is introduced into the various pneumatic lifts, an immediate resistance is created and the air volume decreases. The stock in transit and the pressure resistance results in decreased airflow from the 'no load' phase. It is always advisable to install an automatic butterfly valve infront of the high pressure fan inlet, so that the start up phase can be carried out in a type of vacuum environment. No butterfly valve employed in the milling industry in this situation is fully air tight, but the start up phase is considerably easier with very little air flow, while the wheel is getting up the speed. There are three methods of starting high pressure fans, namely invertors, soft starts and star/delta's. On big 110 kW fans, we know of many situations where the so-called run up time is as much as 28 seconds with star/delta starters. The ideal starter is an invertor, however they are very expensive. Fan handling - direction of rotation and discharge position, i,e, clockwise, anti-clockwise, rotation, fan discharge up-blast of down-blast, etc. Fans should always be placed on anti vibration mountings. Inlets and outlets need rubber damper connections. Fans should have large inspection doors to carry out periodic cleaning of any build up on the impellor. Cleaning the impellor regularly saves motor bearings and reduces vibrations considerably. 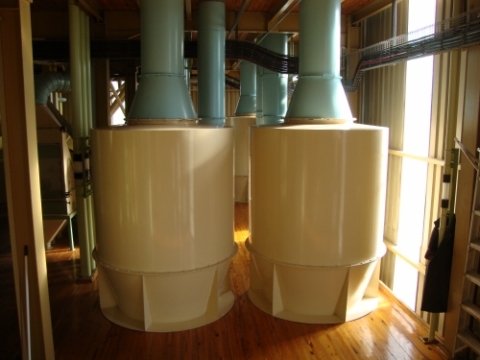 2 X 110 kW High Pressure Fans in Large Capacity Maize Mill. 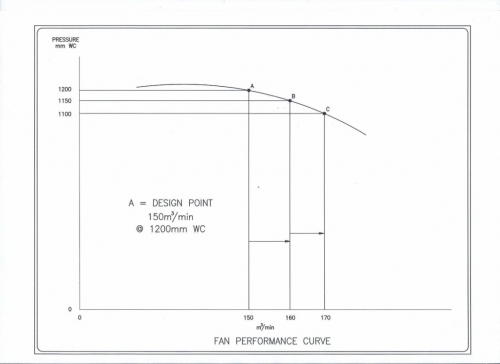 The fan characteristic or performance curve, is the fan manufacturers computer generated document, which is developed considering the customer's volume and pressure requirements. In the illustrated fan curve below, the fan was designed to operate producing a volume air flow of 150 m³/min at the fan inlet at a negative pressure of 1200 mmWC, Point A. One of the biggest problems with mill pneumatics, is that plant operators open the air control valves on the individual lines more than required, resulting in more air volume consumed than is necessary to convey the product quantity on that line. When individual aircotrol valves on the various lines are opened more than required, the operating point on the curve moves to the right- the result is, the air volume flow increases in the example to Point B, where the air volume throughput increases to 160 m³/min, but the pressure drops to 1150 mmWC. Since all pneuamtic systems have a reserve in the design, this may not be a problem, but if the curve moves further to the right with valves being further opened, the air volume increases to 170 m³/min, but the pressure drops further to 1100 mmWC, Point C.
It may well be at Point C on the curve, that quite a number of critical lifts, i.e. the lifts with the highest individual negative pressures, could start choking and a typical reaction of a plant operater to a choking lift, is to further open air control valves on the problematic lines. Any further movements to the right on the curve, beyond Point C, exaggerates the problem further. The ideal fan curve would be one that is as flat as possible, i.e. any movements to the right of the design point, Point A, results in minimal pressure differentials. One does see flatter and steeper fan performance curves from various fan manufacturers. In the milling industry, to remove dust from the pneumatic conveying air before exhausting to atmosphere, cyclones or filters are used. In urban areas, the use of cyclones is almost impossible due to air pollution regulations, as cyclones are not 100 % efficient. 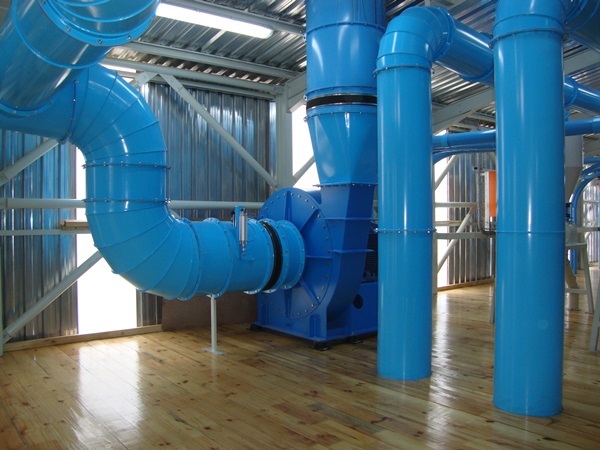 In the case of smaller air volumes, an accurately sized cyclone can perform well, but lacks the efficiency of a filter. Example: 200 m³/min air volume can be handled on a 1500 mm diameter cyclone. Loading a 1.5 m diameter cyclone with for example 250 m³/min of air, will result in a very high airspeed through the cyclone, which in turn will decrease the separating efficiency of the cyclone and also result in a higher resistance (pressure drop) across the cyclone. Filters are available in two different forms: Rectangular cross section filter housings and round filter housings. 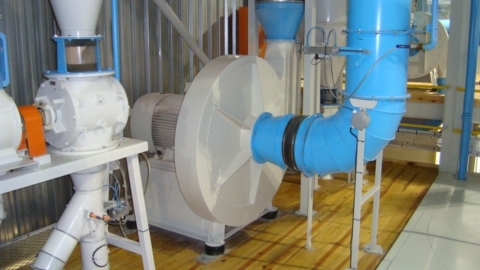 In the maize and wheat milling industry, by far the most commonly used is the round housing. These filters in turn are equipped with two very different bag rinsing (cleaning) systems. The use of normal compressed air from the mill's compressed air network - rinsing at 4.0 to 6.0 Bar pressure. The installation of a low pressure system, operating at 0.5 Bar and the compressed air being produced by a rotary piston blower. 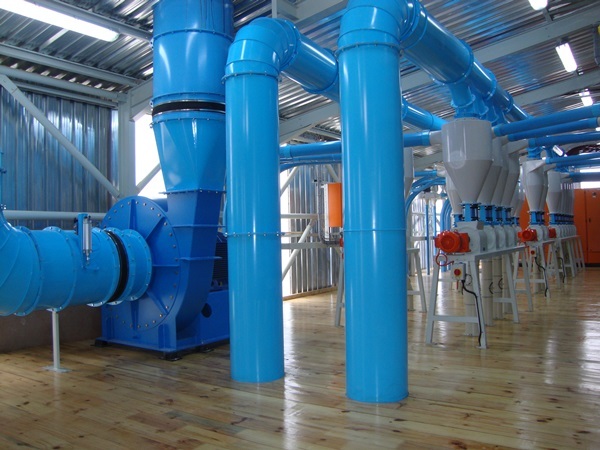 In wheat and maize mill aspiration systems, the specific filter loading factor can be as high as 9 m³/min air/per 1 m² Nett filter surface area when light dust from equipment aspiration has to be filtered. To calculate the filtration speed on a filter one divides the volume in m³/min by the total nett surface area of the filter cloth, eg. on a pneumatic high pressure fan with 60 m³/min, one would require 18 m² filter cloth. The resultant figure is a filtration speed which is expressed in meters per minute - m/min, i.e. 60 m³/min divided by 18 m² = 3.33 m/min filtration speed. On wheat and maize mill pneumatic conveying systems, the filter load factor should not be higher than 4 m³/min per 1 m² Nett filter surface = 4 m/min. The bigger the filters area the better. 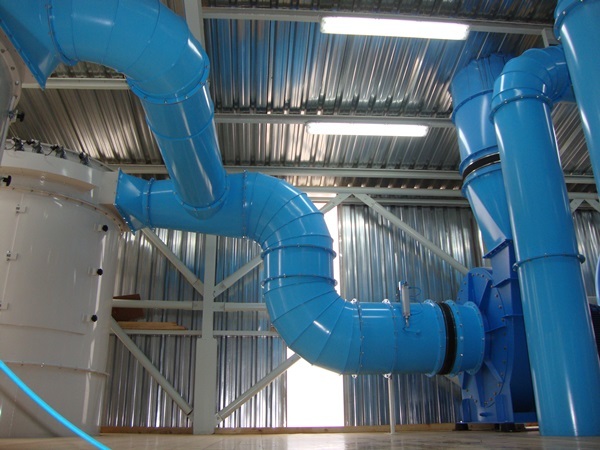 We design mill pneumatic conveying filtration systems on 3 to 3.5 m/min, which has an initial higher installation cost, but results in lower operating costs from the point of view of energy consumption, less resistance across the filter. Another benefit is that the duration between filter bag changing exercises can be extended. 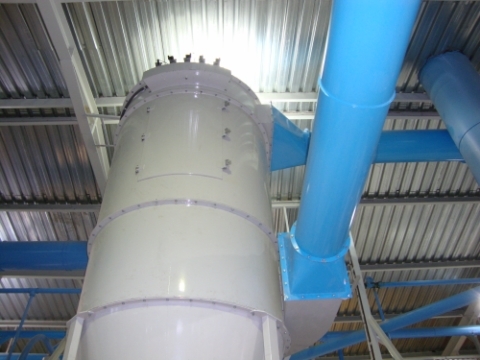 The life of filter bags depends to a large extent on well designed super efficient mill pneumatic receiving cyclones. In well designed mill pneumatic conveying systems, with correct sized receiving cyclones, it is possible to see very little filter flour.